Harukana Recieve new cast members were revealed by the official anime website. They revealed two new cast members and the visuals for them. 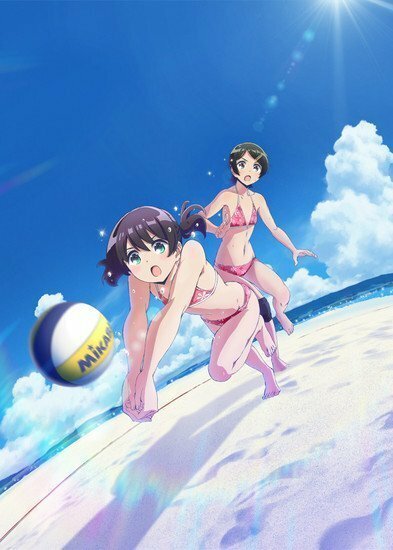 Harukana Recieve is a sports anime that is focusing on beach volleyball. Afer Haikyuu was released, there was a lot of hype for it. And I do think that some people might enjoy watching Harukana Recieve. Although that may be true, I have been hearing a lot of bad things how this anime will turn out to be just another fanservice anime. Honestly, I have not read the manga so I can’t really say if it will or won’t. But I am hoping it will not, the only thing I know about Harukana Recieve is it general synopsis, and it sounds generic. However, since I’m a fan of sports anime I’m quite interested to see how this anime will go, so I bring you this news today. The new cast members are Ai Tanahara (voiced by Akari Kito). She is the one in the back that looks a bit concerned or shocked. And we also have the girl in the front that’s leaping towards the ball. Her name is Mai Sunagawa (voiced by Riko Koike). These two are known as the “AiMai” pair. The anime is premiering on July 6th on AT-x followed by Tokyo MX. The show is also set to air on TV Aichi, Ryukyu Broadcasting Corporation, KBS Kyoto, Sun TV, BS11 and TVQ Kyushu. For more information here is an official synopsis for the HarukanaReceivess anime. When high schooler Haruka moves to Okinawa. She finds herself enamored with the beach right outside her front door. And with that resolves to form a volleyball team with her cousin, Kanata. However, because she’s so short, Kanata gave up on volleyball ages ago. Can Haruka get her to take up the sport again in time for the junior tournament?